Al Ghandi Auto gives the Corvette ZR1 a welcome fit for a King! Al Ghandi Auto welcomed Corvette owners and enthusiasts for the Corvette Track Night - an evening of excitement, thrill and most importantly the discovery of the much-awaited king- Corvette ZR1! 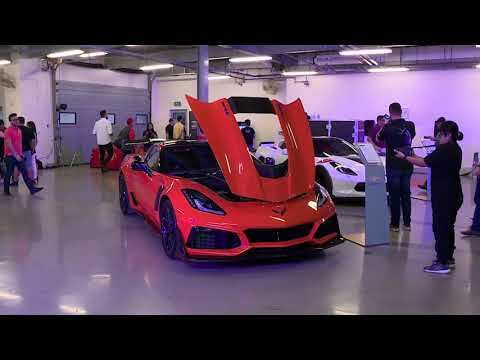 This exclusive event brought together the proud owners of Corvettes in the UAE, to Dubai Autodrome, the perfect venue to unleash the full potential of the ZR1! Drowning in the powerful sounds of these amazing cars and learning more about these stunners was an experience in itself. There was something in store for everyone. Participants were given the “passenger experience” onboard Al Ghandi Auto’s own line up of Corvette cars including their latest release- The Corvette ZR1. Participants also got to safely explore the features of this powerful new beast with a virtual reality simulator that gave the most real life like driving experience. With 755bhp and 715 lb ft of torque, the Corvette ZR1 is the most powerful Corvette, and the most powerful Chevrolet built to date. It claims a top speed of more than 210mph and is available with either a seven-speed manual or eight-speed automatic gearbox, equipped with paddle shifters, marking the first time an automatic has been offered in the ZR1. This event was truly a dream come true for Corvette owners and enthusiasts in Dubai and definitely a fitting welcome for the King Corvette!